Local authorities suspend work on several projects citing cultural heritage concerns. Local authorities in Myanmar have suspended work on an international development complex worth nearly $300 million and four other building projects in the country’s largest city due to their threat to its cultural heritage, The Irrawaddy reported over the weekend. The set of five projects in Dagon Township in Yangon, which stretches over seventy acres, sits on land formerly owned by the military that was sold for developing hotels, apartments and a shopping complex. 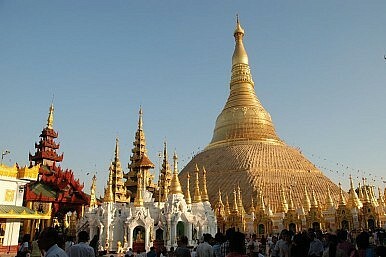 Site development had begun in 2014 despite lingering concerns about its effect on the city’s heritage, particularly given its proximity to the iconic Shwedagon Pagoda, the oldest structure in the city and – legend has it – the oldest Buddhist stupa in the world constructed more than 2,600 years ago. But The Irrawaddy confirmed Saturday that construction had been halted. Toe Aung, the director of the Urban Planning Department in Yangon City Development Committee (YCDC), said the suspension was due to concerns that the projects would violate municipal regulations. These include height restrictions on buildings near Shwedagon to preserve the visibility of the national monument as well as designated green areas in zoning plans. The suspension is part of an ongoing struggle to preserve Yangon’s historic and religious sites amid rising urbanization and development pressures which have only increased since Myanmar’s opening in 2011. Private developers are hungry for land and the government is struggling to meet the needs of the city’s growing population – estimated at over five million and projected to double by 2040 – with soaring real estate prices and snarling traffic jams. But while conservationists recognize the need for development, they have warned that it should not come at the expense of preserving what some say is Southeast Asia’s largest collection of late-nineteenth-century and early twentieth-century colonial architecture, which is central to its history as one of Asia’s largest trading cities with remarkable religious diversity. In 2014, Yangon was included in the World Monuments Fund watch list to raise awareness about the need to preserve its historic urban landscape. And just last month, the group held a forum in cooperation with prominent local conservation group Yangon Heritage Trust (YHT) to distill recommendations for policymakers. While government officials have grown more accepting of the need for conservation over the years, limited urban planning expertise, a weak regulatory framework, and the complexity of ownership structures in some of the old buildings make sustaining a conservation agenda difficult. “The city urgently needs billions of dollars in new investment for new housing and office and commercial space. But it’s critical that development is well planned and within an overall vision of how Yangon should grow and modernize,” he wrote on his Facebook page Friday. YCDC has created an official list of 189 heritage buildings in Yangon, while YHT says there are more than a thousand publicly and privately owned buildings of heritage value. Indigenous and academic perspectives on biodiversity, armed conflict, and self-determination in Karen state.